Winona - The civilized one that uses people to cacth predators. 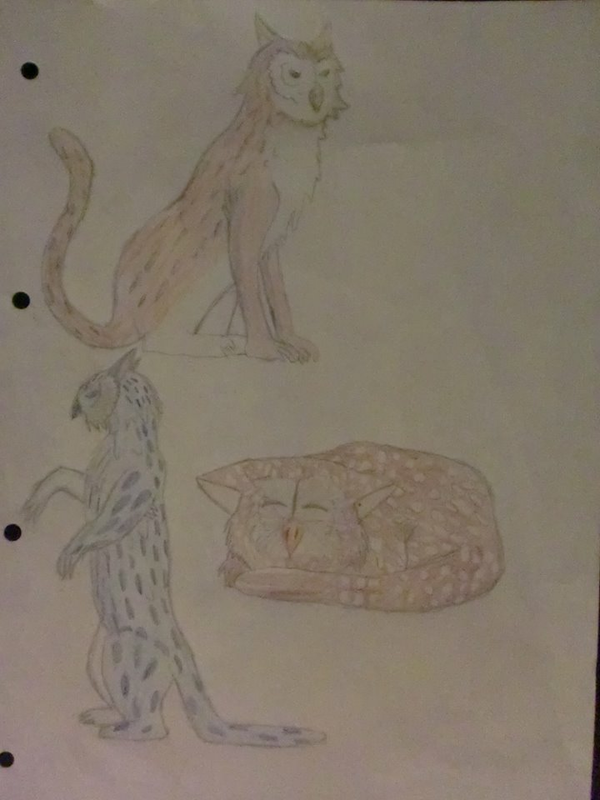 A coloured version of Saskia's drawing. Although I don't have much of a right to say this myself but personally I think it could use just a tad bit more work. But it is still pretty good too and still gives off a mad psyche feeling as well. Another character from my story. Rachael Torin, The Neko who is an Tinie sympathizer, an upstanding member of society and long suffering Supervisor of Winona. She's a non preditorial giant then? Probably not the place to ask this, Agato. But for what it's worth, nekos are man-sized unless otherwise noted. Tinies are three inches tall when fully grown, give or take half an inch. Nekos prey on tinies, just like giants prey on nekos. That irony is considered one of the finer aspects of their species, a lot of people wonder how can nekos eat tinies without the Isolon Eye staring them off. Right probably should have studied it a bit more. >_< Then again I was still under the impression there were Giant Neko's, god more research is needed. I don't know about you, But I thought the waistcoat and office skirt combo and the menction of her supervisory carreer position would be a good indication that she isn't a gaint pred, or has ever even step foot into the jungle. I think the Isolon Eye doesn't work on Nekos because the Magiocrats just don't care for people as small as Tinies. Yeah the irony about the Nekos eating Tinies is why I've centered on them quite a bit in my story. Would be predators living within human society is an interesting but an often not explorered angle, the irony taken further by the fact that Winona and Racheal look and act more sophicated than many of the humans in Negav, they dress in business suits, they have jobs in Negav security, they have a decent home, they use fairly modern gadgets, they have advanced knowledge of psychology (to the point of being able to 'cold read' other people) and Winona smokes catnip like cannabis. What I was going for is that Felarya is much more than a predator vs Humanity devide that most authors make it out to be, the ethical landscape is much more complicated than that. It begs the question of how humantiy is defined, if Winona and Racheal are more sophicated than your avarage Negav human, then humanity is merely a socail structure not defined by the speices you are. You don't have to be 'Homo Sapien' to be considered human, you just need to be sapient. Hahahahaahahaha! That was fun. :3 But seriously, another decent drawing from you, Dark1. The tie looks a little misshapen (I think they're pointier at the bottom), and her body shape looks a little strange. On the plus side, you're getting into a better face:head size ratio, though it could still be improved. I see you've gone with lots of little hairs sticking out everywhere, which I'm not sure how I feel about. To me, it looks kinda' messy, but at the same time it might be more realistic than the way I draw hair. :33 That's all I have to say about it for now. I just hope this is the right place to do that. ^^; Sorry if it isn't! I have to say I don't like Saskia's desgin. It's a bit too stubby in places like the feet and her her face reminds me of a Scare crow. Though I kinda wish I'd have seen that hair design when I did Fay the Ugly Centaur's sketch. It's evey messier than the one I did and it took days to figure out! XD Though even though I find some parts of her character design to be odd I do have to say it does give her a uinque look over all when put together so fear not. As for the second I love that businesseque look! o.O You do it so well. Though I have to ask why do you always use messed up hair? It contridicts the pure "clean" look their clothes give them. I am still trying to write my next chapter where Saskia is introduced, unlike Winona and Racheal where I written their introductions and then drew them. So I guess any flaws with Saskia could be down to not having her personality pined down properly in the story yet. But she's surposed to be the choatic counterpart to Winona, she has simular skills to Winona and a simular intelligance but on a emotional level she is childish and while Winona manlipuates as an means to an end, Saskia does simply because it's fun and has no plan other than to make humanity suffer for her amusement. So the stubbyness is surposed to give an more childlike appearance to her, and she is a socail outcast so she is surposed to be odd and unique. Actually Nyaha you can get flat bottom ties, most do indeed come with pointed ends but flat ones do exist. I do see these drawings as protypes though, they give the general sense of character I want to get across. But it doesn't mean I won't try to further refine them over time. I don't know of a single artist who's character's haven't evolved in appearance over time. It's a process I am quite used to. Talking of Saskia, just saw a trailer for the upcoming film 'Silent hill: Revelation' and this character came up that reminded me alot of her. I mean that's exactly what I'd imagine she would look like if you changed the anime style for realism. I just finished a line drawing of Fiona Void and Ramtov, based on the events of issue 4 of Karbo's manga. But I like how you drew the Tychos. I personally would have gone with a darker color, but I find the blue and orange to be well done. Hasuta, one of my OC's ^^ I am very proud of how it turned out.